I’m going to let you in on a secret recipe today; a recipe from my husband’s Portuguese family. Having a hard time figuring out what dish to make or bring to your next event? Look no further; bring Portuguese Beans! A big pot of these flavorful beans are easy to make and a big favorite around here. We make them for family gatherings, BBQ’s, and parties. If by chance you have any leftovers, they taste even better the next day for lunch or with some runny eggs for breakfast. I like this recipe because it is very flavorful and has only a few ingredients. These beans go great with any meal, whether it be hamburgers and hotdogs, steak, chicken or eggs! I like to use beer in the recipe, but if you want to have a gluten-free pot, it is easy to substitute the beer for chicken broth and it will be just as tasty! I’ve fed about 20 people with this recipe, when it is a side-dish. Technically it’s about 26 servings of beans or so. I cook it in my regular large sauce pot. It’s a pretty cheap dish as well. A huge can of beans costs about $5, bacon $2-5, tomato sauce $2-3, and everything else less than $1. So you can feed over 20 people for about $10. 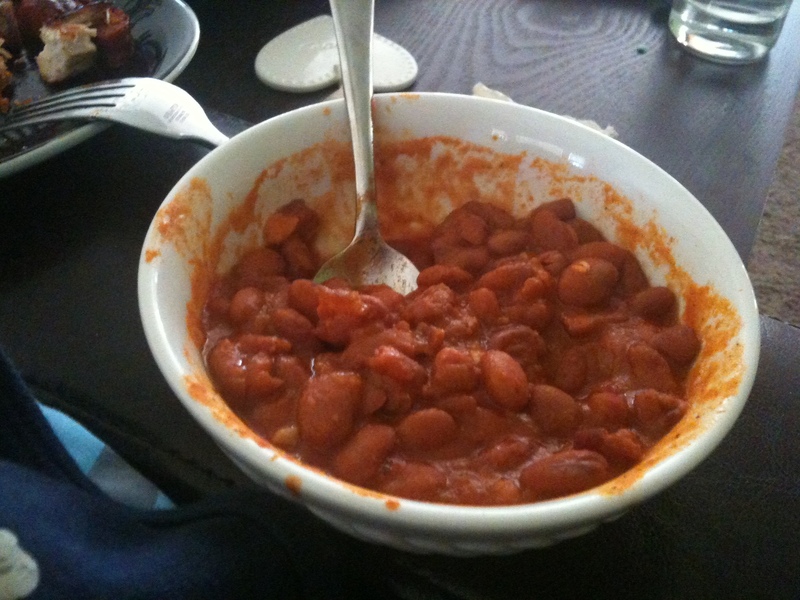 A bad picture of the beans; I always forget to take a picture because I’m too busy eating them and they are gone by the time I remember! Awesome! I need to make them again, soon! Especially since we have been having rainy days.